The Amsler grid (or Amsler chart) is a simple and effective method of monitoring your vision for macular degeneration. 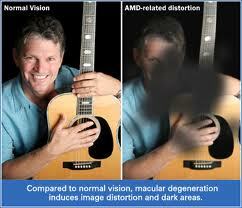 Age-related macular degeneration (AMD) is a disorder of the macula, which is the central part of the retina. This affects your central vision, and you may notice as though a blurred or distorted area had been placed in the center of your vision. The image around the blurred area may be clearly visible. This is well illustrated in the example below. An abnormality in the appearance of the grid pattern may indicate macular degeneration. If you notice any abnormality, arrange a consultation with your ophthalmologist without delay. Early treatment of AMD means better outcomes! Testing your central vision with the Amsler grid is one of the best ways of monitoring for symptoms of macular degeneration. 1. Print an Amsler grid or bring it up on your computer screen. 2. Choose a well-lit and bright room. In this room, pick a wall or door or location that is away from any window glare. Some people prefer to use the refrigerator door in the kitchen. 3. Affix the grid on this wall or door. If you are using your computer screen, then place your computer in this location. The center dot of the grid must be at your eye level. So decide whether you want to do the test sitting down or standing up before you tape the grid in position. 4. Place a mark (best done with tape) at the point which is 14 inches from the grid. Use your ruler or tape measure to be as precise as possible. 5. Stand or sit facing the grid at the 14-inch mark. Make sure you wear your normal reading glasses or contact lens. 6. Cover one eye with your palm (make sure no light can enter), and look at the dot in the center of the grid. 7. You should see all 4 corners of the grid, as well as the horizontal and vertical lines. 8. While looking at the dot, look for any distortion or blurriness of the grid pattern. This may appear as a blank, smudgy or wavy patch. If you notice any abnormality, try to note down its position. Either tell your assistance or mark it on the grid with pencil. 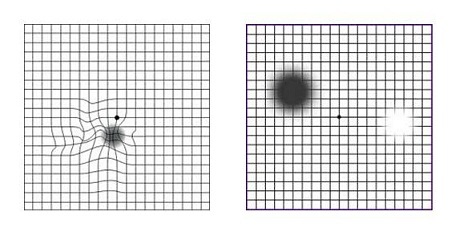 This is an example of the blank patches (left) and distortion (right) that macular degeneration may cause when testing with the Amsler grid. Monitoring your vision with the Amsler chart is an important part of any AMD prevention strategy. If you notice any abnormality in the appearance of the chart pattern, arrange a consultation with your ophthalmologist without delay. The earlier AMD treatment is started, the higher the chances of treatment success. 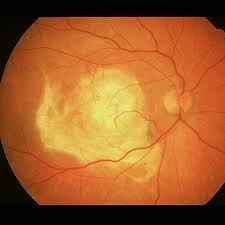 Consult your ophthalmologist without delay if you suspect you have symptoms of age-related macular degeneration. 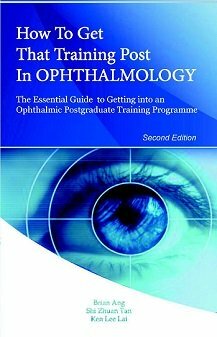 If you delay and your macula becomes completely scarred as above, then treatment will not be successful and your central vision will remain poor.